Fruit tastes better when allowed to ripen on the tree – don’t you agree? It can be tricky to get the timing of your picking quite right though, because it’s also a good idea not to let it get too ripe. It’s apricot season at the moment, and they’re a good case in point, because if they’re a bit ripe when you pick them, it’s really easy to damage them. One of the risks of letting fruit get too ripe is that you’ll get a picking injury at the stem end, as you can see in the following photo. 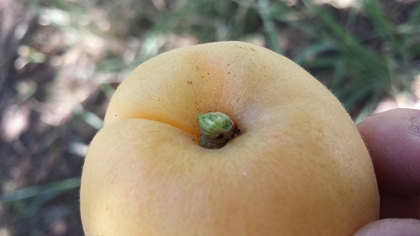 The fruit has pulled away from the stem when it’s been picked, and made a little tear in the fruit. 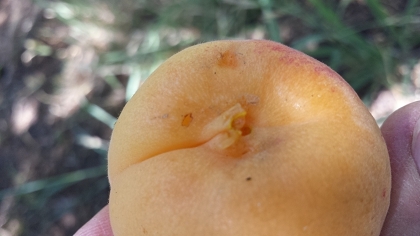 Unfortunately this may make the fruit continue to ripen too quickly off the tree as it is likely to soften quickly at the scar site, and it can quickly go mushy. The injury can also make the fruit vulnerable to brown rot, particularly if you’re growing organically (and we hope you are!). 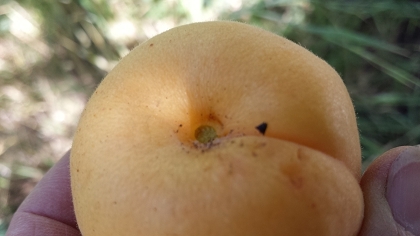 Brown rot is much more likely to start if the fruit is injured, particularly if you’ve had a rainy season before the fruit was picked (because there’s likely to be more brown rot spores on the fruit). If your fruit is a bit overripe when you pick, use it as quickly as possible, or get it into the fridge to keep it in good condition. But mainly, try to avoid picking injuries when you harvest! It can be complicated getting the details right, so we’ve developed Fruit to be Proud Of to help home growers know how to choose the perfect time to pick fruit, learn great technique and proper storage practices to make the most of their precious fruit. Previous Previous post: Apricot bottling and berry tarts!